All transactions are safe and secure with a reliable history in online purchasing behind each of our associates. 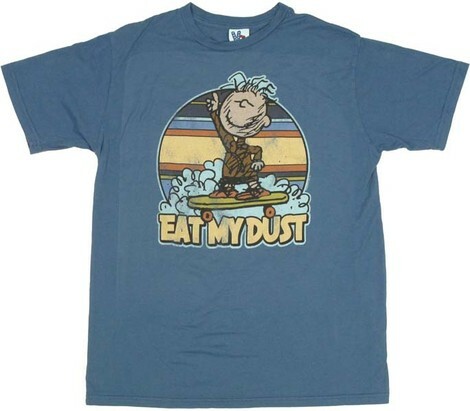 Buy the Junk Food Eat My Dust Pigpen t-shirt to own Peanuts clothing and merchandise. If Charlie Brown tees don't do it for you then maybe this Pigpen t-shirt will. The brown and blue design enhances the essence of Pigpen himself, and the witty quote "Eat my dust" perfects the flow. So if you are looking to get dirty, advertise it with these Pigpen Peanuts t-shirts. Pair it off with more great Peanuts clothing or a Charlie Brown action figure for a gift that any fan would love to receive. In addition to the Junk Food Eat My Dust Pigpen tee above, browse the Peanuts Clothing Gallery for more apparel like men's and women's clothes, kids shirts or hoodies.